Home National News & Views California and the U.S. Heal Nick Hinkins! “I’m going to win my fight over sickle cell anemia,” declares little Nicholas Hinkins. Nick and I and his five brothers and sisters will be sharing our thoughts, feelings and insights as Nick goes through this journey toward healing. Please check his website, HealNickHinkins.com, for updates on his progress. We also hope to help raise awareness about the disease. After all, 5-year-old Nick is not alone – 90,000 to 100,000 people in America and millions worldwide are diagnosed with sickle cell anemia. Together, we can ensure better odds for future generations. Nick’s journey to living free of sickle cell anemia can be shared and inspire hope for all. The only possible cure for sickle cell anemia is a bone marrow transplant, but, as the National Institutes of Health explain, most of the sickle cell sufferers are not able to find matching donors. Nick’s twin brother Christopher is a perfect 100 percent match! Chris’s bone marrow can possibly save Nick’s life. But we must go to Atlanta, Georgia, for the treatment. Such a rare and wonderful opportunity for a cure – it’s unthinkable that financial barriers could prevent Nick from benefiting from this one life-saving chance. We must begin soon. 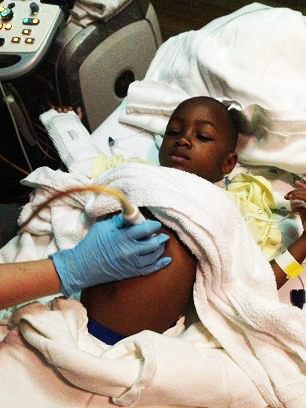 Nick’s sickle cell crises are getting more frequent and severe by the day. Nick has grown only one pound in the past year because the disease requires all his energy just trying to survive as his bone marrow must keep producing more and more blood. Nicholas Hinkins is a loving child who reaches out to everyone around him with a ready supply of hugs and kisses. Nick’s doctors estimate that the entire transplant process will require a full year of his life to medically prepare his body for chemotherapy, transplant, recovery and rehabilitation. Saving Nick’s life will require our family to relocate to Atlanta for at least a year, while I take unpaid leave from my job in Anchorage, Alaska, to care for them. Nick, enduring another painful crisis, hopes help will come soon. Nick’s sickle cell crises are getting more and more severe. His last episode in the hospital almost cost him his life. He had acute chest syndrome, which caused him to struggle with all his might to get enough oxygen in his lungs to survive. Nicholas Hinkins – we call him Nick E Poo – is a 5-year-old little boy. He has been a loving child all his life, reaching out to everyone around him with a ready supply of hugs and kisses. He has a smile that lights up the room. He loves to listen to stories and play with his twin brother Christopher, whom he adores with all his heart. The twins are so close that they try to do everything together – but often they can’t because Nick is so terribly ill.
I’m told Nick will die from the complications of the disease one day, but the bone marrow transplant can reverse its effects. When the sickle cells get stuck in various parts of the body, they damage the tissue around it. You can have a stroke if the blood sickles in your brain or have acute chest syndrome if they sickle in your lungs. Most people have to have their spleen removed because it becomes full of sickle cells, their gall bladder too. These are just some of the things that the disease does to the body. Right now, our family lives in Anchorage, Alaska, because, in a tough economy, this is where I can earn a living. I also have extended family here – my father, brother, two uncles, many cousins and their families – to rely on. But Alaska is a terribly hard place for a child with sickle cell anemia to live. Playing outdoors in frigid temperatures will send him to the hospital for yet another “extreme pain crisis.” He sits indoors most of the time watching his brother and friends play outside. Not only that, medical resources near our home are scarce. His last episode in the hospital almost cost him his life. He had acute chest syndrome, which caused him to struggle with all his might to get enough oxygen in his lungs to survive. Obviously, this dangerous situation can’t continue indefinitely. May 15, 2014: “This episode in the hospital almost cost him his life. We must get ready to go to Georgia next month to start the bone marrow transplant process,” says Nick’s mother, Michelle. Dr. Willie Ratcliff’s son, Elder Glenn Ratcliff, pastor of Calvary Community Church of God in Christ in Anchorage, Alaska, with First Lady Linda Jewel Ratcliff, embrace just a portion of their family in Anchorage: Isaiah, Neci, Mya and Davin in the next to back row; Jaden, Evan, Lila and Natalie; and Christopher, Cameron, Ethan, Glenn III and Nick E Poo in the front row. Both of Dr. Ratcliff’s other sons who live in the Anchorage area, Lafone and Stanley Ratcliff, are deacons in the church and proudly head large families of their own. They all ask you and your church family to join them in helping and praying for little Nick’s survival. Bone marrow transplants are long, complex medical ordeals, but this procedure is Nick’s only hope for survival. His doctors estimate that the entire transplant process will require a full year, including numerous appointments for preparation, chemotherapy, transplant, recovery and rehabilitation. Saving Nick’s life will require our family to relocate to Atlanta for a year, and we desperately need donations to make this one-year move. The ongoing intensity of Nick’s medical procedures will make it impossible for me to work during this period, so we need resources to travel to Atlanta, find lodging near the hospital and make ends meet for a year. Health insurance is essential, of course, but when lives are at stake, the actual medical expenses are only the beginning of the devastating costs that families must pay. Every day that Nicholas spends in Alaska is another day that delays his chance to be cured of this terrible disease. He weighs only 30 pounds at age 5, and with the amount of pain he suffers every day, life is a constant struggle. Financial help from generous donors is the only way that this brave little boy can win his courageous fight for survival. Readers can visit HealNickHinkins.com or GoFundMe to learn more about Nicholas and donate for this lifesaving procedure. If you prefer to support Nick via mail, please send your generous donation, made payable to Nicholas Hinkins, to Healing Nick Hinkins, P.O. Box 111277, Anchorage, AK 99511-1277. You are welcome to call me at 907-764-7600 or email me at healnickhinkins@gmail.com. Having a bone marrow transplant is the only hope for saving this little boy’s life, and his entire family is profoundly grateful for donations in any and all amounts. May 20, 2014: Michelle writes: “My poor baby woke up out of his sleep in extreme pain. I had to carry him to the bathroom because his hips hurt so bad. I gave him some Tylenol with codine, Motrin and Zantac all together. The first two are for pain, and the last one is given so it won’t mess his stomach up from having to take it so much. His stomach feels rock hard. “Please keep Nick in your prayers. If it gets worse, we will have to take him to the hospital today. It also may be time for another blood transfusion. He must keep getting these because his body can’t make enough blood to survive. The sickle cells die off after 10-20 days. Everybody, please pray for Nick and help us by going to HealNickHinkins.com. This is my Grandson and he has a lot of support from his father side of the family and I am one of his biggest cheerleaders and will do any and everthing I can do to help him have a brighter future Grandmother love you so very much!!! Please provide the website so that I can donate for Nick. Jesus touch and heal his body! good The app can be easily downloaded via 3G, Wi-Fi or some other means of Internet that is accessible. Also, to avoid errors of the graphic card, it is best to make sure that the graphic card of your PC is up to date. nice. good This request is certainly designed for smartphones and tablets jogging Android os units for the point in time but you can as well enjoy it on laptop. Below is certainly your likelihood to discover how to download Xender for Laptop or computer.nice. good The Whatsapp has actually officially revealed the usage of the Whatsapp from the COMPUTER is enabled as well as users could make use of it. nice. good on Apple's application shop as a result of the sorts of task that the application could be made use of to take part in The ideal option, best. she'll choose another place where no stepping over waste is required Giving numerous litter boxes for multiple felines could likewise save. Microsoft launched its most awaited Windows 10 previously this year, and it is without a doubt one of the most spoken about OS for sure greatly because the IT titan made this Windows. Once you have developed your online account, you will certainly be Imagine being able to identify your coworkers for a task well done from. Amazing post… Xender Application is the most driving and awesome application which is utilized for send, exchange and get records. You can easily install Xender for PC Windows . If you are blackberry user, then you can also install Xender for Blackberry (9900/9360/9220). Otherwise, if you wants to Download Xender for IOS/iPhone , you can easily install it.You can also download the Xender app for MAC PC .